HTC recently passed Nokia in market capitalization, and there are strong underlying reasons for that. Wall Street rewards profitable companies by bidding up their shares, and Apple's shareholders know that all too well. The Taiwanese company just announced its January-March quarterly results - net profit almost tripled to $511 million, compared to the same quarter of last year. Now we can again say that what changed in the meantime is the surging popularity of one little green robot, whose incessant march conquered the world of mobile last year, and is likely to continue well into the next few years as well. Of course, it also helps that the company is focusing on the high-end, and not churning out cheap smartphones or feature phones. With phones like the HTC EVO 3D, tablets like the HTC Flyer, and the first mass LTE phone, the HTC Thunderbolt, it obviously intends to observe the same mojo this year as well. Due to the strong sales of its Android phones, HTC's shares have already surged with a third this year, making the company's chairwoman, Cher Wang, the richest person in Taiwan. Wow HTC is on a roll. They still have not dropped the Evo 3D or the Pyramid. Imagine what the profit they will make when those 2 juggernauts drop. I have never been so satisfied with a mobile company like I am with HTC. It's a pleasure to say I own a HTC phone. They go out of their way to update their phones with the latest OS's in such a timely manner. Good for HTC. They will keep me a customer because I am a happy customer!!! That is good business!!! HTC is only getting better!! Work for HTC, do we? Great handsets.....now if the battery would last longer than an hour,.....we could take advantage of it! As a complete side note, do you think Windows 7 and Nokia are nervous yet? 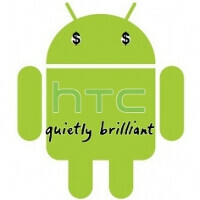 HTC has put out solid W7 phones, but only the Droid is mentioned. Why would HTC, Motorola, Samsung or anyone else continue to invest in the W7 platform when the Green Happy Robot is so profitable, and developing that Microsoft OS would help the competetion? Kudos to HTC. Windows 7 phones are growing so there is a market for them. As RIM falls Windows is gaining from their downfall. HTC's first phones were Windows phones before Android even existed so we can give Windows a big thanks for giving the young upstart HTC a chance to get to where they are now. HTC is what they are now because of Android.. I don't think they're nervous, in fact, I think Nokia would like it if no one else put out any Windows 7 phones.